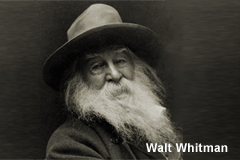 This is one of my favorite poems by Walt Whitman. It's something to think about when the Holiday frenzy starts getting to you. It's a little perspective on things. Things that matter, and things that don't.